Organizations of all sizes are moving their Windows workloads to the AWS Cloud, and many of these workloads - including business applications, home directories, web serving environments, and software build setups - depend on shared file storage. Today, customers need to do the time-consuming and costly work of managing Windows file storage on their own. We recently introduced Amazon FSx, a fully managed Windows file server service. In this tech talk, we will do a deep dive into Amazon FSx for Windows File Server, walk through a demo, and targeted use cases to get started today. You will learn about the Amazon FSx for Windows features and benefits, how to identify applications that are appropriate for use, and details about its performance and security models. 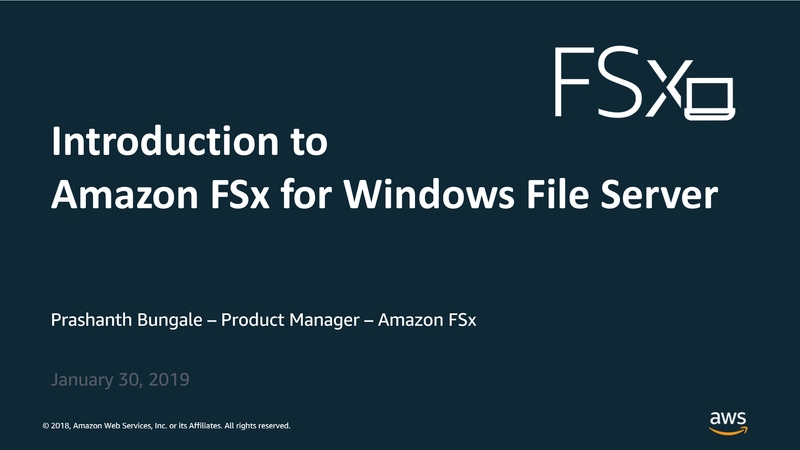 We will highlight and demonstrate how to deploy Amazon FSx for Windows File Server in our most common use cases and will share tips for success throughout.